FBS Server is the main application within the Ferro Backup System. It is activated only on one computer in the network, which will function as backup server. It is used to prepare and send backup tasks as well as receive and save backups. The application console includes seven main tabs which allow the whole System (server and workstations) to be monitored, to configure it, check on scheduled tasks and restore data. All tabs and dialogs are described in the following chapters. Move the pointer over the column heading and click on the displayed filter button. Backup now - performs default backup task on the selected workstations. Cancel - cancels the current backup task on the selected workstations. Add - adds a new workstation with default settings. Add all non-configured stations - adds all connected workstations, which are not yet added. Modify - displays a configuration window for adjusting the settings of the selected workstations. Delete - deletes selected workstations and their backup tasks. Backup now - starts selected backup task. Cancel - cancels selected backup tasks. Add - displays a configuration window for defining all parameters of a new backup task. New task will be added to all workstations, the existing tasks of which have been selected. Delete - deletes the selected backup tasks. For every workstation there has to be at least one (default) backup task. A default task cannot be deleted. In order to delete all the tasks of the workstation, select and delete the entire workstation. After selecting several workstations or backup tasks (SHIFT + Click, CTRL + Click), the type Setting window works in the global settings editing mode. In this mode, the multiediting menu, which helps define the modification mode, fields to save, is available in the lower part of the window. This way, it is possible to quickly change one or multiple settings for all selected workstations and tasks. Input settings are read from the benchmark position. The benchmark position is the first selected workstation or backup task from the top. The name of the benchmark station or task is displayed as first on the settings window title bar. To change the benchmark position after selecting a workstation group or backup task group, click the selected workstation or backup task while holding CTRL. The Workstation Settings window is used to add or modify settings for selected workstations (of a remote computer) or the selected workstation group. The most frequent changes include: workstation description, compression level, blocked files backup and remote commands. The window appears after clicking Add or Modify in the main window in the Backup tab. See below for a detailed overview of all the settings available in this window. Active workstation - turns the workstation on or off. If the workstation is not active, the server does not plan any backup tasks for it and does not warn about pending tasks. Friendly name - any text facilitating computer identification, e.g. file server or accountant. Group name - any text defining a group of computers, e.g. servers or accounting. Computer description - space for comments regarding the workstation. WARNING. Changing the advanced settings is not necessary to ensure proper operation of the software. Changing some parameters may disrupt data transmission or prevent the workstation from reestablishing the connection. Time to wait for packet - Time to wait for a packet. Currently this needs to be set to 0. Maximum packet size - Maximum size of transmitted packets. Entering a value higher than 16384 can increase the transfer rate but if the transmission is broken while the backup is being sent the received file may contain errors (packets lost). Time interval between reconnection attempts - Time interval between subsequent attempts to reconnect to the server. Compression priority - defines maximum CPU usage during backup. During a backup operation FBS Worker reads files from a disk, compresses them and sends them to the server. This places a significant load on the CPU, particularly using poor equipment. If the backup is performed while the user keeps working with the computer, it is possible, for comfort, to set a lower compression priority. 0 means the lowest and 6 the highest priority. To ensure user comfort, you can set it to 0, meaning the application will only compress when the CPU is idle. Setting it to anything below default value will involve less CPU usage and longer backup times. Setting it higher than default value may shorten backup times. Note. Setting the priority to 6 may mean that the operating system will not respond to the user's commands until the backup is completed. ZIP compression level - ZIP compression level. Range: 0 (no compression), 1-3 (fast compression), 4-6 (standard compression), 7-9 (maximum compression). Default value: 4 0 means that the files will not be compressed. Values between 1 and 9 define compression level. Small values mean faster compression, less CPU usage and larger archives. High values mean better compression (smaller archives), longer compression times, more CPU and memory usage. Maximum cache - Maximum buffer used for file compression. If set to 0, the best buffer size will be used - ranging between 524288 and 1572864 B. If small values are used (less than the default) compression times are longer and the resulting ZIP archives are larger (lower compression). It is not recommended to use high values (higher than the default). This will consume more memory, lengthen compression times and only slightly improve compression. Cache size for ZIP stream - The size of the cache memory for the compressed ZIP stream. 0 means switching off cache memory. The upper value is limited by the size of the available RAM. In order to limit demand on the application's memory, you can reduce the cache below the default value. However, if the cache is set below 65536 B, transmission speeds fall dramatically, the amount of information sent over the network rises sharply and the load on the workstation's and the backup server's CPU increases. Values higher than the default may increase the backup speed, reduce the amount of data sent over the network and reduce the load on the workstation's and the backup server's CPU. If the set cache value is higher than the available RAM, backup will not be possible (error: out of memory). Open/locked file backup - (Open File Manager) this can be used to backup open files, i.e. files which are locked by other processes in the system. Files are backed up in the OFM only if they cannot be opened any other way. Most often locked files are database files and system files. For large files (> 100 MB) it is recommended to schedule backups for periods when information is saved less frequently. If the OFM cannot obtain a coherent file image within 60 seconds (for database files this is the status after a transaction), the file will be skipped and a relevant note made in the Event Log. Note. Files which are open (locked exclusively) can only be backed up under: Windows NT 4.0, Windows 2000, Windows XP, Windows 2003, Windows Vista, Windows 7, Windows 2008, Windows 8, Windows 2012. Files need to be placed on a local, uncompressed FAT 12, FAT 16, FAT 32 or NTFS partition. File open retry - Number of attempts to open a file. This is used to define how many times the application should retry to open an input file if a read error is encountered. If during the backup operation there are errors caused by the application's inability to ensure the integrity of input files, this should be set to a higher value. Interval between subsequent read attempts - The interval between subsequent read attempts of source files. This defines the time interval between subsequent attempts to read a source file. Set this value higher if there are integrity errors in input files. Process security descriptors - defines whether to save information on file and directory authorizations. This option may be useful for file servers in order not to redefine access privileges after file recovery. Turn off this option if saving security descriptors is not necessary. Turning this option off increases backup size, RAM use by program and slows down the backup process. Process encrypted files (EFS) - defines whether to process encrypted files on NTFS partitions. Encrypted files are backed up encrypted and can be restored only on NTFS partition. No - skips encrypted files and reports warnings "Access denied"
WARNING. EFS certificates and keys are required to decrypt files after restoring them on another computer. Remember to make a backup copy of certificates and EFS keys or a system register, in which they are stored. Otherwise, it will not be possible to decrypt the restored files. Process link information - defines whether after a link (Reparse Point, Junction Point, Symbolic Link) it is necessary to process elements in the target point or to store only information on the link. WARNING. Following hook ups is not recommended because the same files may be backed up more than once, which may lead to recursive looping. Synchronize workstation clock with server - if this field is active, the date and time on the workstation will be synced with the date and time on the server. Synchronization takes place whenever a connection is established and whenever time or date settings are changed on the workstation. Generate warnings on network errors - if this field is active, the program will generate warnings if network errors occur (disconnection and reconnection of the workstation). If the workstation uses radio access network, this option can be turned off. Associate the workstation with this backup server - this option allows to block network connections with unauthenticated backup servers by associating (pairing) the workstation with a specific backup server. When installing the client (FBS Worker), the network name or IP address of our backup server is defined. The client automatically connects to the specified backup server. If a workstation is connected to another computer network, where there is a foreign backup server with the same IP address or network name, the workstation will connect to this computer. This option must be enabled to make the workstation connect only with our backup server. To enable the connection of a workstation to another backup server, this option must be disabled or the client's software must be uninstalled and reinstalled on the workstation. Remote commands are plugins and they expand functionalities of FBS Worker - the client's software. They can be used to run additional commands, scripts or applications on workstations. For example: before backup you can map a network drive or stop a database server, and after backup you can defragment a drive or shut down the system. Remote commands are launched with the privileges of the account, on which FBS Worker runs. Test - sends a remote command to the workstation and launches it. The result of a remote command will be returned to the control console. Wait - here you can choose whether FBS Worker, after launching a remote command, should wait for its completion before continuing with the task or not. This option should be active if a backup task or other remote commands depend on the result of the remote command (see: example no. 2). Command - defines the name of an executable file (.exe, .bat, .cmd, etc.). If necessary, enter the full path before the file name. Parameters - (optional) list of parameters to be sent to the executable file when it is launched. You can use Windows environment variables (local variables and system variables) (e.g.. %COMPUTERNAME%, %USERNAME%) and software variables %TASKNAME%. The %TASKNAME% variable will be replaced with the name of the current backup task when the command is launched (e.g. BASIC). The use of the %TASKNAME% variable enables you to execute a remote command on a contingent basis, depending on the backup task in progress. The Task Settings window is used to add or modify settings for a backup task or group of tasks. The most often changed settings include: task name, schedule, range, backup type and versioning. The window appears after clicking Add or Modify in the main window in the Backup tab. See below for a detailed overview of all the settings available in this window. Task name - defines the back up task name. The most frequently used are names that describe backup range or frequency, e.g. : DOCUMENTS_EVERYDAY, SYSTEM_FRIDAY. Default task - a task marked as "Default" is run when the workstation is active and the button "Back up now" is pressed in the application's main window. Schedule - scheduling backup tasks. Daily - The backup task will be run every day at the time indicated in the field Start time. Day Intervals - The backup task will be run automatically after a certain number of days. Hour Intervals - The backup task will be run automatically after a certain number of hours. Minute Intervals - The backup task will be run automatically after a certain number of minutes. Days of the week - The backup task will be run automatically on selected days of the week as defined in the Days of the Week field. Start Time - In the Start Time field you can schedule the archive task start time to 1 minute. Next Time - In the Next Time field you can set the date for the next backup operation. Skip and execute later- the task will only be executed at a specified Start Time. If the workstation is not connected to the server at this specified time, the task will not be executed until the next time. Execute immediately once computer is connected - if the workstation was unavailable at the specified time, the task will be executed immediately upon connecting the workstation to the server. This option is recommended for laptops as they are often unavailable at a specified time. Warn of delays longer than [times] – if a task has not been completed the selected number of times, a delay warning entry will be made in the Event Log. Backup on system shutdown - you can choose whether file backup should be done before shutting down the computer. Always (2) - a backup will be performed at each system shutdown. Unlike the previous option, the backup schedule with the "always" option on is not updated after the backup is completed (no new backup is scheduled). Disk failures most often occur during power on or off. The "Backup before system shutdown" option has been added in order to enhance data protection. It backs up all files created or modified since the last backup, even when the user shuts down the computer prior to the scheduled periodical backup. 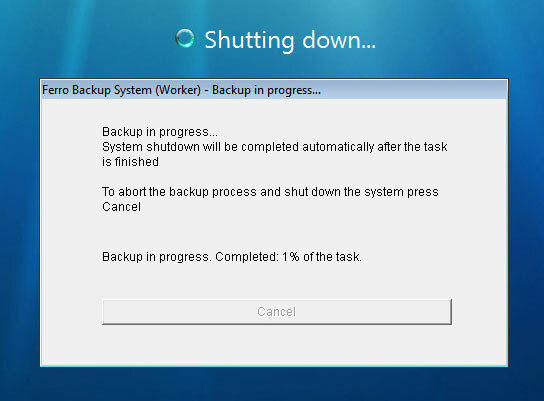 If this option is on, the backup is started when the user attempts to shut down the system (selecting "shut down" or pressing the power button on the computer). A dialog appears informing the user that the backup operation has started. The workstation user may cancel the backup and shut down the system immediately by pressing the Cancel button. If this option is active and the user shuts down the computer during the backup process (launched according to the schedule or manually by the administrator), this task is continued as if it has been launched by the system shut down event; if this option is disabled, the backup task will be aborted. Note. If the "Back up before system shutdown" option is on, the dialog may be displayed for a certain time (~10 seconds) at each system shutdown, even if no backup is required according to the current settings. During that time FBS Worker will interface with the FBS Server to check whether the task needs to be launched. The system shutdown will be completed after the backup operation is finished or connection with the backup server is lost. In the Range part, you can define volumes, masks or full paths to files and directories, for which backup is going to be executed and those, which are going to be excluded from backup. After clicking Add or Modify, a dialog is displayed, which contains a list of drives, directories and files of the remote computer. Files and directories for backup - a list of files and directories for backup. The list can include specific files or file masks. File Masks to Skip - a list of files and directories to be omitted from the backup operation. The field is used to exclude a file or a number of files from the File Masks to Back up list. The list can include specific files or file masks. See below for a list of files and directories to be excluded from backup. Files and directories from the list are not important to restore. If the backup includes the following files and directories, the backup process may be significantly prolonged. In some situations, backing up these files and directories may make it difficult to complete the task. Note. If you intend to back up the whole hard disk, remember to skip the abovementioned files and directories. Add - adds files or file masks to a list (back up list or skip list). Modify - enables to change the highlighted file or mask. Delete - deletes selected entries from a list. C:\*. * -N/A- All files from C: and all subdirectories will be backed up. C:\*.rtf -N/A- All DOC and RTF files from C: and all subdirectories will be backed up. In order to back up files located on another computer on which you cannot install FBS Worker and perform the backup operation locally, you need to map the resources of the remote computer under a local drive letter. Please note that the mapped drives visible to the logged user are not available (not visible) to FBS Worker. That is why the drives need to be mapped directly in Ferro Backup System using Remote command (command: NET USE). The application also allows you to back up the shared resources of another computer without previously mapping it under a local drive letter. In this situation the resources on the remote computer must be available without authentication because there is no way to enter the user name and password. To display a list of files and folders available on the other computer, enter the following path to the UNC in the Path field, in the View window: \\server_name\share_name\ and press ENTER. Note. ACCESS TO NETWORK RESOURCES - A local system account on which the FBSWorker is installed by default does not have access privileges to network resources. Therefore it is necessary to switch the FBSWorker service to an account which has such privileges (e.g. an administrator account) or to set relevant privileges for the Local system account. This can be done from the MMC Services console (Control panel->Administrative tools->Services). Differential - differential backup. It is recommended in most cases due to greater speed and space savings on the backup server compared to full backup. Delta - differential backup at file fragment level. An advanced option of the differential backup recommended for tasks including files larger than 20 MB which are often modified (mail files, databases, etc.). Periodical full backup – this enables you to reduce the level of dependency between differential backup archives. In the case of differential backups the application only backs up those files which do not exist (or exist only in older versions) in the previous backup files. Thus after a certain time dependency develops between backup archives – newer archives which are connected with older ones. When information is restored from a differential copy, files are extracted from the selected differential backup archive and previous archives linked to it. If a large number of archives is stored (see: Rotation copies) and any of the differential backups is damaged or deleted, some of the files may not be recoverable. To reduce that risk, check this option. Note. This option is not required to ensure correct backup and restore. The period is calculated differently for various backup schedules. Two solutions are used: one based on the quantity of files (ZIP archives), and the other based on the quantity of scheduled dates. The first one is used for schedules where it is not important when (on what day) the full backup copy will be made. The other allows specifying the exact date and time of performing a full backup. See the table below for an overview of the Period option functionality along with examples. -Schedule: Once per given number of hours = 2; Period = 4; Period Start = 1.00 p.m.; Full backup performed once every 8 hours - at 1.00 p.m., 9.00 p.m., 5.00 a.m. File encryption algorithm – here you can select an algorithm for file encryption. Three encryption algorithms, currently considered the best, are available: Rijndael, Serpent, Twofish. Just as during compression, encryption is performed on the computer on which the backed up files are located. Thus the backup copies are already secured when they are sent to the backup server over the network. All of the implemented encryption algorithms use 256-bit keys. The encryption password must be set in the Password management window. Note. Encryption may significantly slow down the backup process (Twofish is the fastest encryption, Serpent the slowest). Please note that ZIP archives encrypted in the Ferro Backup System can only be opened with FBS Server - Restore tab. Rotation backups (how many previous copies should be stored) – defines how many backup copies can be stored on the disk. If this option is on, the application will delete the oldest backup file (ZIP file) from the disk if the current number of backup files in the FBF directory is higher than the value set in this field. E.g. if the value is 7, after the 8th copy is completed the application will delete the oldest ZIP file. For differential backups, the last differential backup is deleted. The option “Optimize to save disk space” applies to differential backups. If it is on, the application will move files between different ZIP archives so that a ZIP file can be deleted as soon as possible, thus freeing up disk space. Note. Ferro Backup System uses advanced mechanisms to move files between ZIP files without actually unpacking and repacking (decrypting and encrypting) them again, which significantly speeds up the operation. This should not, however, be used on slower backup servers since the time to complete a backup task may then be significantly longer. At backup server (default) - local storage on the backup server. A workstation send its backups to the backup server, and then the FBS Server saves them in a chosen location. At workstation - local storage on the workstation. To save backups directly by the FBS Worker on the indicated drive available from the workstation. This option may be used, e.g. for backups of computers outside the company's HQ, where the backup server is located. Thus, during backup the data do not have to be sent, usually by a low bandwidth, to the backup server. In order to ensure the necessary level of efficiency, the backup directory should be located on a local hard disk or an internal disk array (RAID). Using network disks is not recommended. A network disk can be used as an additional storage location. For details see:Replication. The Replication tab is divided into three separate subtabs: Disk drives, Optical drives and Tape drives. In each one you can configure replication settings for the selected media. Replication options, which are the same for all drive types, are described below. Drive-specific options are described further on. Automatic - the replication will be performed automatically when backup and verification operations are completed. Set Schedule - here the user can schedule replications. Replications can be performed at a preset time based on one of the following patterns: daily, every number of days, every number of hours, on selected days of the week. This option is only active when the replication mode is set to "Schedule". Replicate now - this will replicate all backups included in backup tasks selected for replication. This is only active when the replication mode is set to "Manual". Simulation Mode - this will check that the replication settings are correct and the drives are ready. This command will perform all activities involved in the replication of backups except the actual copying, deleting, writing and marking replicated backups. Cancel - use this to stop the current replication process. As writing must be successfully completed, it may take up to several minutes to cancel a replication to optical media or tape media. Next replication - here the user can choose the next scheduled time of replication. This option is only active when the replication mode is set to "Schedule". Events - an extract from the Event Log describing replication events for the selected drive type. Replication for the backup task is activated in the Task Settings window, in the Replication section. Backup files on the backup server will be synced with files from the location specified in the field “Target replication directory." FBF subdirectories in the replication location will be created automatically. Replication to disk drives involves the synchronization of those backups from the FBF folder which belong to a selected backup task located on the backup server with a folder of the same name stored in the location selected as the "Target (replication) directory". Backups stored on the backup server which are not in the replication folder will be copied to the replication folder. Backups in the replication folder which are not on the backup server will be removed from the replication folder. Archives whose contents on the backup server differs from backups of the same name located in the replication folder will be deleted from the replication folder and copied again. After the replication of backups assigned to a selected backup task is complete, the backups stored on the backup server and in the replication folder will match. Backup files located on the backup server will be saved on a medium located in the optical drive. FBF subfolders will be created automatically. Saved files are marked as “replicated to optical drive” and will not be saved again during the next replication (see: RepAttrib command). Backup files located on the backup server will be saved on a medium (DDS, DLT, LTO, AIT, etc.) located in the tape drive. FBF subdirectories will be created automatically. Saved files are marked as "replicated to tape drive" and will not be saved again during the next replication (see: RepAttrib command). Before using a tape for backup replication it should be formatted in FBTF (Ferro Backup Tape Format) using the "Delete" command. FBTF files can be retrieved using the "Read file..." command. Fig. 2.2 FBS Server - Replication on a streamer with autoloader support. Below, only options available for tape libraries and autoloaders are described. Loop load subsequent media in storage - prior to every replication, a medium is loaded from subsequent socket. If the socket is empty, the program checks and loop loads tapes from subsequent sockets. Load medium from the socket for a given day of the week (0 - Mon, 1 - Tue, etc.) - prior to every replication, the program loads a tape to the medium from a socket corresponding to a given day of the week. It means that on Monday the tape from the first socket will be loaded, on Tuesday from the second socket and on Sunday from the seventh one. Load medium from the socket for a given day of the week (0 - 30) - prior to every replication, the program loads a tape to the medium from a socket corresponding to a given month. In the Restore tab you can view backups and restore data from them. The Ferro Backup System makes it possible to perform full backup and differential backup. Nevertheless, whatever backup type you choose for your workstation, the data restore procedure is always carried out in the same, user-friendly way. Fig. 3.1 FBS Server - Data restore. Workstation - a drop-down list where you can select the computer to view or unpack backup files from. The name of the workstation can be selected from the list or entered by typing. The list includes the names of computers which are defined in the System (they are displayed in the Backup tab) or were defined (have been removed and no longer appear in the Backup tab) but their FBF directory containing ZIP files are on the server. You can thus restore data from currently defined workstations and from workstations which are no longer connected to the System. After selecting a workstation a list of available backup files will be displayed in a field below. Backup files list - this shows a list of available backup files for a selected workstation. Each item specifies date and time of file creation. The number of items in this field corresponds to the number of backup files currently stored on the server. If no backups have been performed for a workstation, the field will be empty. Here you can choose, by selecting only one item, which data (from which day) is to be viewed or restored. It is thus possible to restore data not only from the last backup copy but also data from a specific date. After selecting an item from the list, a directory tree will appear in the right-hand window showing a list of backup files. Backup copy content - a list specifying file names, extensions, sizes and backup dates. After selecting a directory or a file, the Restore or Unpack button above becomes active. Please note that if a large number of differential backup files from your workstation are stored on the server, building a directory tree might take a while. Restore or unpack - use this to unpack (extract) selected files or directories from ZIP archives. In full tasks, only files from a selected full backup are restored. For differential tasks, the selected differential task is restored as well as all previous backup archives linked to it. After clicking on Unpack a window will pop up in which you need to enter a destination path for the selected files or directories. Destination Path - use this to define a location where to unpack files. Where network location is selected (Original Location or Selected Workstation) files are unpacked to a temporary directory located on backup server and then sent to the workstation. FBS Worker receives files at the workstation's end and saves them in a target directory. Replace existing files – use this to overwrite existing files without asking for confirmation. If this option is not selected, existing files are skipped. Based on this entry, the operating system will delete the locked file and replace it with an “.fbr” file on reboot. A list of files to be restored on reboot is saved in the Event Log. Restore link information - restores file and directory link information, if the option Process link information was enabled during backup. Restore security descriptors - restores file and directory security descriptors, if the option Process security descriptors was enabled during backup. The selected items will be saved in a designated location, preserving the original directory tree layout, file modification date and file attributes. Show tasks in progress - shows the number of active tasks to restore. The list of tasks to restore is displayed after clicking the button. After selecting a task, it is stopped. Search - use this to search for files and directories with a particular name in a selected backup task. In full tasks only a full backup is searched. For differential tasks, the selected differential backup is searched as well as all previous backups linked to it. Wildcards may be used for search. The Network Monitor tab is used to monitor the operation of the backup server. It includes two information fields, buttons to stop and launch the TCP server and buttons to load a virtual command line on the backup server and workstations. Computer name (server) - NetBIOS or DNS of the computer on which the FBS Server is running (see: Backup server). Active connections - number of workstations connected with the server. The number of connections in progress (when the server and a workstation are still negotiating a connection) can be displayed in brackets. Inactive connections - number of workstations defined in the Backup tab which have not established connections with the server. Maximum number of connections – the maximum number of remote computers that can connect to the server. Maximum number of connections depends on the purchased license (number of stations). In the evaluation version it is 2, which means that only 2 workstations can connect to the server. Exceeding the connection limit by installing the FBS Worker on more workstations than permitted in the license will shut down the TCP server. When you install the FBS Worker on workstations you need to state the name or address of the server. Those name and address details are displayed here (Computer name, IP address). Fig. 4.1 FBS Server - Network monitor. Version – version of the FBS Worker software installed on the workstation. Start - Launching of the TCP server. The TCP server is launched and waits on port 4531 for incoming connections initiated automatically by the FBS Worker software installed on workstations. The Launch command is executed automatically when the FBS Server is run. Stop - this disconnects all workstations and shuts down the TCP server. This command is initiated automatically when the FBS Server software is stopped. The Event log enables you to make sure the System is operating correctly and to search for the causes of any problems. The Log tab makes it possible to systematically monitor all generated events pertaining to the operation of the whole System( the server and workstations), such as errors, warnings and notifications. All recorded events can be filtered according to event type and computer name to which the notification referres. Fig. 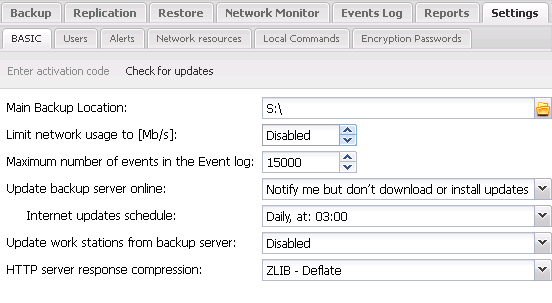 5.1 FBS Server - Event Log. The event list can be filtered according to event type and computer name. Events which do not meet the criteria defined in the filter(s) are not displayed. Regardless of filter settings, however, all events are always logged in the event log. Clear - clears the whole event history saved in the database. Events will be removed when the FBS Server is launched again. It is recommended to clear the event log regularly to increase system performance. Auto Refresh - if you turn this on, the event list will be scrolled automatically to the last logged event. Turning it off will enable you to view the whole history of logged events. If you do not analyze the contents of the event log, it is recommended to switch this off to reduce server load. Reports enable the System's activities to be analysed quickly and easily. With reports it is no longer necessary to constantly monitor the System and analyze the Event Log. Reports are generated in HTML format and then uploaded to the Internet Explorer window in FBS Server. Using Administrative alerts, reports can be automatically generated and sent to a designated email address or FTP/web server. Three types of reports are available. They are described in table 6.1. Task Summary Displays the following details for every workstation and every task: number of scheduled tasks, number of tasks completed successfully, number of tasks failed, percentage of successful tasks, number of tasks “in progress”, number of warnings, and status. For backup tasks which yielded errors or warnings, additional records are displayed showing error or warning details. Only scheduled tasks – i.e. tasks which have been properly scheduled - are included in the report. Delayed Tasks Displays information about scheduled backup tasks which have not been completed. For each delayed task the process shows the length of the delay and the number of failed attempts. Additional records explain causes of failure. Only scheduled tasks – i.e. tasks which have been properly scheduled - are included in the report. 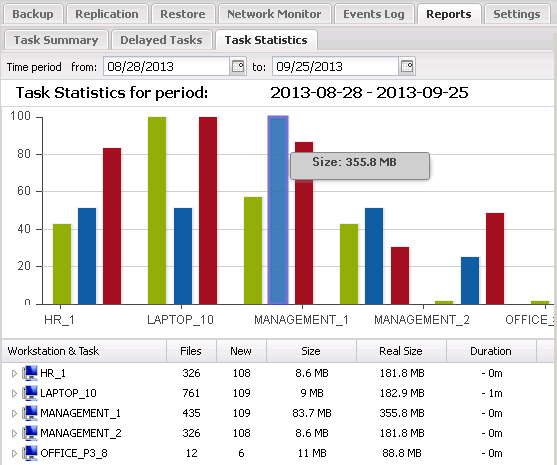 Task Statistics This shows summary statistics for each workstation and each backup task and detailed statistics for a specified backup task. Each record shows the size of the completed backup archive, the number of files backed up, the number of new files in a differential archive, task duration and the average data transfer rate. Storage Inventory The report shows the use of space on backup server disks, divided into workstations, backup tasks and backup files. Each item may have information on the number of backups, the total size of backups on the disk and the date of the last backup. The graph shows free and used space on each storage disk. You can set time intervals for each report. For example, in the "Delayed tasks" report you can choose to display only tasks which have not been completed for a specified number of days, weeks or months. In the "Task summary" and "Task statistics" reports you can define a time interval for data analysis. Main Backup Location – this field should specify the full path of the backup copy (ZIP files) location. If the specified directory does not exist, it will be created automatically on the first reference to that directory. If the path is invalid (it points to a missing drive or contains invalid characters), an error message will be shown and the server will be stopped. The directory will include FBF subdirectories for all workstations. The main backup storage location can be changed in the Workstation Settings window, setting a different path for each backup task (different hard disk or disk array). In order to ensure adequate performance, the backup storage directory should be located on a local hard disk or an internal disk array (RAID). Using network disks is not recommended. A network disk can be used as an additional storage location. For details see: Replication..
Limit network load - you can set the maximum computer network load here. Maximum number of Event Log entries - use this option to limit the amount of information stored in the Event Log and so reduce the FBS Server launch time. Notify me but don't download updates - the program will, at a given time, check if a newer program version is available online. If a newer version is available, a warning will be recorded in the Event Log, stating that the installed version is not up to date. Automatically download and install updates - the program will, at a given time, check if a newer program version is available online. If a newer version is available, the program will automatically download and install the update. The program update process can be postponed if the program is performing other tasks or the user is working on the computer. Enable - enables automatic software updates for work stations. The update is executed while connecting the work station to the backup server. After backup server (FBS Server) software installation (manual or automatic), the current work station software version (FBS Worker) is also stored on the server. The server sends a software copy to a work station while establishing a connection. The work station installs the new software version. While executing the update, the work station disconnects itself from the backup server for about 1 minute. The program update process can be postponed if the program is performing other tasks (backup). HTTP server response compression -turns on or off ZLIB-Deflate compression used by the HTTP server embedded in FBS Server. Enabling compression may increase the loading speed of the control console through an Internet browser. Allow HTTP connections only from these IP addresses - increases security by restricting remote access to the control console for the selected source IP addresses. If a connection originates from a different IP address, it will be rejected by the HTTP server. Connections from the localhost are not blocked. The list may contain one IP address or multiple IP addresses, separated by commas. Disk write cache - this option allows to write back or write through the system cache for writing operations performed by the backup system. Enabling the write cache may increase the backup and replication speed. These options should be disabled in order to limit CPU and RAM usage. Two-Person Control Administration - this option allows to increase access security to backups and the most important administrative operations. The principle of operation is to limit access to restricted data by the necessity to authorize all operations performed by the second operator (the so-called "two-man rule"). This option is useful in companies and institutions (e.g. banks, governmental institutions, army), where additional security procedures are required. Data recovery by the operator or administrator to the backup server. Data recovery by the operator or administrator to another workstation than the original one. Data recovery by the operator or administrator to the original workstation unless the user of this workstation is logged into the control console. Changing settings of the Two-Person Control Administration. The operations can be authorized locally, in the same console where the operation was initiated, or remotely, in all the control consoles with administration rights. Any operation that is not confirmed within 60 seconds is cancelled by the System. Enter activation code - displays a dialog that enables to enter the activation code to the licence key. When the correct key is entered, the program is registered and in the Network Monitor tab the licensee name and purchased number of hook ups will be displayed. If this option is inactive, it means that the program has already been registered. Check for the updates - FBS Server checks for the latest updates on the Internet. If an update is available, a new instruction will be displayed: Download and Install. When the update is finished, FBS Server will download a new version of the program on the backup server, then it will install it and restart FBS Server service. Here you can create user accounts for accessing FBS Server control console. If there is no account, the access to the console is not protected and everyone gets an administrator access. Observer - an account with backup and restore process supervision but without privileges to control them or change program settings. Administrative alerts are notifications including reports or chosen messages of the Event Log, which can be scheduled to be sent to designated email addresses, web servers (see: FTPUSE command) or syslog servers. Send empty - if this option is enabled, the alert is always sent at the same time. If this option is disabled, an alert is sent at a precise time only if it contains some data, e.g. for an alert Event Log entries with Error parameter, an alert will be sent only if since the last sending off, some events with Error status have been entered into the Event Log. It is necessary to configure network resources directly in FBS Server, because drives and network connections put together in various login sessions are not available for system services, such as FBS Server, which operate in separate sessions. Adding network resources is necessary only when a resource is available through SMB protocol (Samba/ Network environment). If iSCSI is used, defining network resources in the program is not needed. Connection status - executes command NET USE on the backup server and returns a result in the virtual command line window. Network resources are connected automatically when FBS Server is trying to access a given network resource - before backup, before replication, before sending an administrative alert or before opening a dialog for selecting the target directory. If a connection attempt is unsuccessful, the current operation that requires access to a given resource will be interrupted, and a relevant error will be entered in the Event Log. The minimum interval for reattempting to connect is 60 seconds. This limit is not used for manual connection (Connect button). A local system account on which the FBS Server is installed by default and does not have access privileges to network resources. Therefore it is necessary to switch the FBS Server service to an account which has such privileges (e.g. an administrator account) or to set relevant privileges for the Local system account. This can be done from the MMC Services console (Control panel->Administrative tools->Services). Local commands allow to extend functionalities of FBS Server. They enable automatic running of external programs, scripts or input files, perform operations on files, use ActiveX components, control Active Directory services etc. Local commands are built on the basis of FBS Server infrastructure Windows Script. FBS Server, like Windows Script Host (WSH) or Internet Explorer, is a script host independent from the language. Local Command scripts have access to Microsoft ActiveX (COM) components, Application Programming Interfaces (API) for Windows Management Instrumentation (WMI) and ADSI as well as additional functions integrated in FBS Server. Test - check the script syntax as a whole and run a procedure indicated in procedure launch edit field, on the right hand side. The code is executed on the backup server with account privileges on which FBS Worker runs. Procedure launch edit field - used to provide the name of the procedure to be run (test run), along with all the parameters to be sent to the procedure. A syntax as per the script language chosen must be used in this field. Script to be executed on backup server - space for script code. The Local Commands code can be written in any (previously selected) script language installed in the operating system on the backup server. By default, two Active Script engines are available in Windows: JScript and VBScript. To use other script languages, first install an engine for a given language in the operating system. The most commonly used script languages are: JScript, VBScript, Perl, PHP, Python, Ruby, Object Pascal, Forth, Haskell, TCL. Local Commands use an events mechanism. FBS Server generates events in a given program operating status and runs a procedure to handle this event as defined by the administrator in Local Commands. For example: “BeforeBackup” event is generated before backup and control is transferred to “BeforeBackup” procedure. If the procedure to handle an event has not been defined, FBS Server will not generate the event. All the available events along with declarations of procedures to handle events and parameters are described below in detail. AppType - a number that specifies the program running mode. This parameter may have the following values. To skip a backup, return "false"
Error - a number that specifies the backup result. This parameter may have the following values. NewFiles - number of new or modified files in the backup. If the value of this parameter is equal to Files parameter value, it means that this copy is a full copy. Saving the list of files contained in a backup copy (ZIP archive) when using 7-Zip. 7-Zip is run from the command shell (CMD) to forward the standard output stream from the screen to the file. RepType - a number that specifies the replication type. This parameter may have the following values. If an error has been handled, the true (1) value must be returned. In that case, the last replication will be retried. If the same error occurs when the operation is retried, replication will be interrupted (OnReplicationError event will not be generated again). If the false (0) value is returned, replication will be interrupted. SScript (server script) is an object integrated in FBS Server. It is a global object, created automatically, available from any location within the script. SScript is an equivalent of WScript integrated in Windows Script Host. It provides access to several useful methods and properties which are described in detail below. EventType – a number to specify the event type. This parameter may have the following values. Full – a logical value to specify the formatting type. This parameter may have the following values. intTime – an Integer number to specify a period expressed in milliseconds during which a script is to be suspended. Command – a string of characters to specify the command line to be executed. It may contain a full access path or just the program name. The program name may be followed by additional characters, which will be sent to the program as parameters. If the path is not specified, the program must be located in a path stored in PATH environmental system variable. WindowStyle – an Integer number to specify the way in which to display the window of the program being run. This parameter may have the following values. WaitOnReturn – a logical value to specify script behavior after starting the program. This parameter may have the following values. It retrieves or sets the maximum script completion time expressed in milliseconds. The default is 180000 ms. If the limit is exceeded, an exception will be generated and script execution will be stopped. SScript is the only object integrated in FBS Server. However, any automation objects (OLE) can be used in Remote Commands. Access to other objects is made available in a manner specific to each script language. By example, for JScript language, you need to call ActiveXObject; for VBScript - CreateObject. Here follows a list of the most common used automation objects. An object used to run programs, manage the system register, create shortcuts, etc. Here, you can enter passwords, used by the System to encrypt data during backup and decrypts them during data restore. If no password is defined, backup is not encrypted even if in an Encryption algorithm for the settings of backup has been chosen. Note. Deleting a password used to encrypt an archive will make subsequent restoration of information from that archive impossible. Multiple decryption passwords and one encryption/decryption password can be defined. The FBS Server can be launched as a system service or , in an emergency, in user application mode. Working as a system service is the main operating mode configured for automatic execution of backup of FBS Server. The service is launched automatically at the system startup. Once started, the service works in the background, by default, on a local system account. FBS Server control console is available by an Internet browser. If there are any problems running the service or the service shuts down, read: Launching program in the diagnostics mode. If the program launches correctly in diagnostic mode, you should load control console and then, go to the Events Log and diagnose the problem with launching services, by searching for the last errors reported by the program. If the operation of repairing database fails or the program running in diagnostic mode reports another error, contact technical support. check whether the network firewall on the backup server does not block incoming connections to TCP 4530 port. TCP 4530 port is on the backup server and is open for incoming messages. For diagnostics, the firewall or an anti-virus application may be temporarily switched off. If all the above mentioned testing steps have successfully been executed and still there is no connection with the control console, please contact the technical support. FBS Worker is a small program (140 kB) which, when requested by the server, makes backups of files, folders or entire drives and sends the resulting backup copy to the server. The backed-up information may be compressed and encrypted. The compression process is carried out “on the fly” while the file is being sent (no temp files are created), which is why backups can be performed even when there is not enough space on the workstation’s disk. The encryption process is also performed locally on the workstation, which significantly improves the security of transmitted information. FBS Worker is ready to use right after installation. The program is launched automatically during system startup. No additional configuration is needed. The remaining information in this text is for IT specialists only. See below for a sample configuration file FBSWorker.ini, which the program uses to load its settings during startup. Changing default settings is not required to ensure correct System operation. ;Comments: currently this must be set to 4531. In order to change the settings, open the FBSWorker.ini file in any text editor (Notepad, WordPad), and then save it as text. Changes made will only take effect after the program is launched again. This is where the name/IP address of the backup server is stored (of the computer on which the FBS Server is launched), as entered by the user during program installation. If during the use of the System the FBS Server is moved to another computer or if that computer’s name or IP address changes, the user can change the server location in this field to the correct one. Changing this field manually will have the same effect as launching the installer and reentering the name/IP address during the installation of the FBS Worker. Optionally, you can provide the name or IP address of a secondary backup server separated by comma. Number of the TCP port used to connect to the server. Information. The computer name should not be longer than 15 characters. The FBSWorker.exe can be launched as a system service or user application. Working as a system service is the main operating mode configured for automatic FBS system backup. Once started, the service works in the background, by default on a local system account. If there are any problems running the service or the service shuts down, launch the FBSServer as an application and view the system Event Log. When run as an application, the program functions exactly the same as in system service mode, but is stopped when the user logs out of the system. In addition, if the program is working in this mode, the following text will be displayed in the FBSServer console: "FBS Worker operating in the emergency mode”. To run the program as an application, run FBSWorker.exe directly without any parameters. either by IP address or host name. The FBS Worker application is launched automatically upon system startup and, at selected intervals (the RECONNECTINTERVAL option), attempts to reconnect to the selected computer (the HOST option) using the TCP 4531 port. When the connection is established, the computer’s name and IP address are displayed on the list of active workstations in the FBS Server program in the Network Monitor tab. check that the TCP 4531 port is not blocked by any firewall software. In order to diagnose why there is no connection between the workstation and the backup server, you can use the TCPCHK program available in the Download section.